← Where Has Thanksgiving Gone? During Christmastime, our workbench transforms into “Ornamentation Station,” a festive place where little elves can create all kinds of adorable Christmas Tree ornaments! 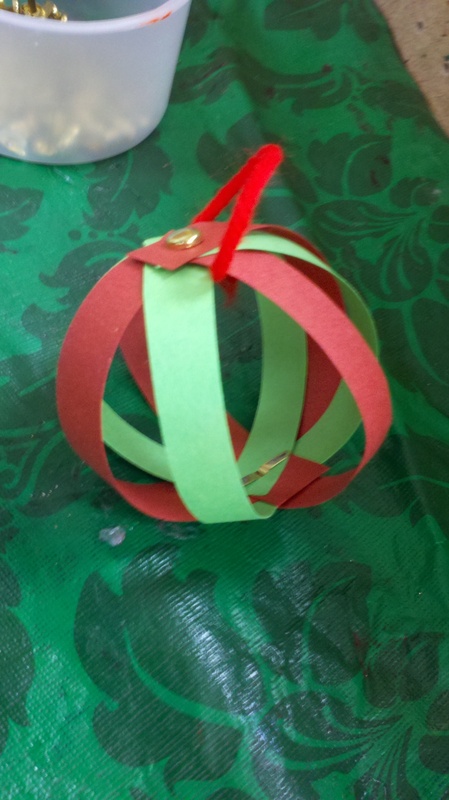 Usually the ornaments are something very simple that the kids can create independently. 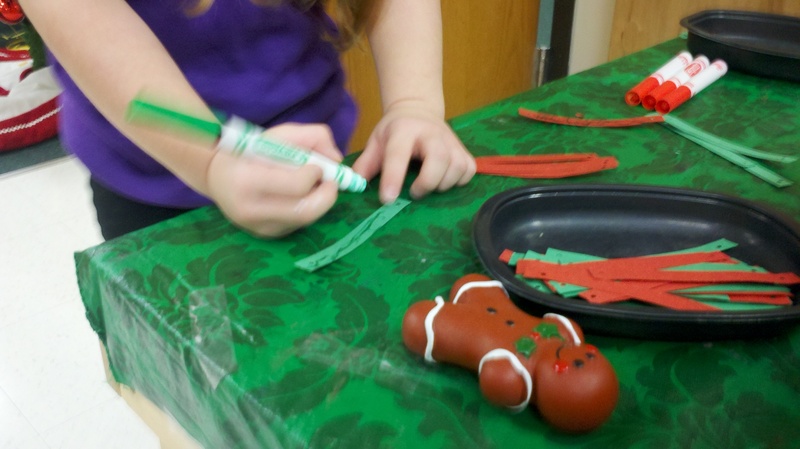 The following are a few examples of ornaments the kids could make at the Ornamentation Station. The gingerbread men were made by using sandpaper and our Ellison die cut machine, but they could easily be made by cutting the sandpaper into gingerbread man shapes using scissors. We put cinnamon sticks at the table as well as stick-on buttons or other decorations. 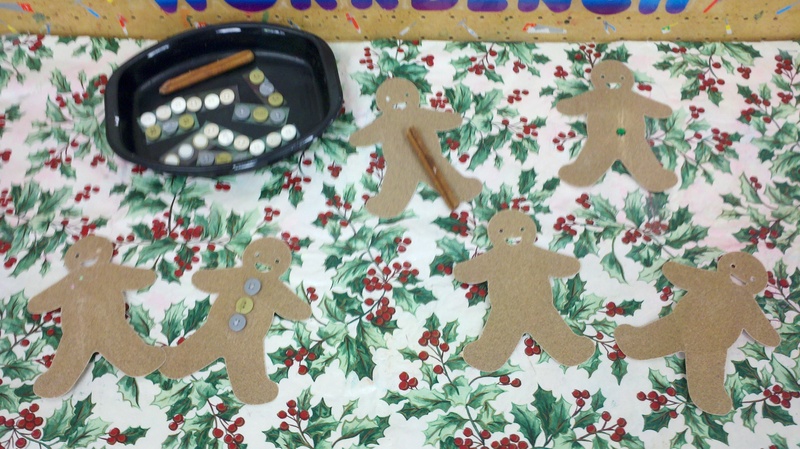 The children simply rub the cinnamon stick on the sandpaper gingerbread men to make it smell wonderful, then decorate it however they would like. This one required a little bit more assistance from the teacher, but was great for some of the older kids as it promotes fine motor control, following step-by-step directions and patterning. At this point I have to admit that I got this idea from Martha. Yes, I saw this Martha Stewart ornament on Pinterest and loved it! The idea is simple. I provided the children with paper strips with holes punched at each end, as well as some brass fastener brads. First, they decorated the paper strips using markers (if they wished). Then, they secured their series of paper strips with the brads on each end of the strip (they needed the most help with closing the brads). Then they fanned out the paper to make it into a ball. I helped them tie a length of yarn to it so they could hang it from the tree! Stay tuned for even more Ornamentation Station ideas! This entry was posted in Fine Motor, Holidays, Preschool, Seasons, Teacher, Workbench and tagged Children, Christmas, Fine Motor, Ornaments, Preschool, Teaching, WorkBench. Bookmark the permalink. Thanks! They turned out so pretty! I didn’t get to the paper ornament when I clicked on the link you had, so here’s where I found it!